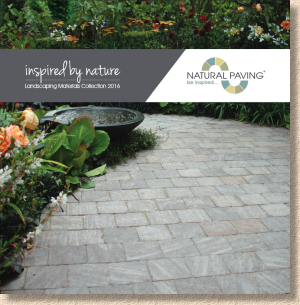 I'm not sure why, but along with a handful of other notable paving suppliers, the Natural Paving 2015 brochure never received a review on this website. Admittedly, last Spring was chaotic with me moving house and having yet another short spell of illness, but it's only now, as I work through the 2016 brochures and look back to what I wrote, or didn't write, in 2015, that it becomes apparent just how much was missed during that time. 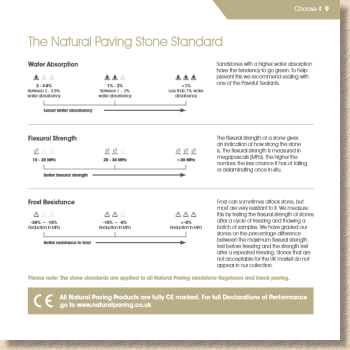 It wouldn't be fair to compare the 2016 Natural Paving brochure against the previous review, back in 2014, so I thought I'd dig out the 2015 brochure and see what has changed, and consider whether it's for the better or not, but no sign of a 2015 brochure! Was there one? Would that explain why no review was done last year? Anyway, what have we got this year? Well, it's certainly an impressive-looking production. Square format (230x230mm) with a stiff card cover, an OK-ish main image (the Magenta Fossestone Pavers are not their most appealing product in my opinion), a prominent logo, and weighty, too, which shouldn't come as any surprise when you realise there are 160 full-colour pages to enjoy! The first 15 pages are given over to a double-page contents guide, which helpfully marks all the new products, and then some self-promotion, but promotion focussing on quality and ethics, so we can allow that to pass. Natural Paving Stone Standard However, the self-declared "Stone Standard" leaves me slightly bewildered. As a guide to judging the suitability of certain Natural Paving products it may be of assistance, but it doesn't help judge between NP and similar products from rival suppliers, some of whom have their own completely different 'standards', so how useful is it really? Further, it's only being applied to the NP sandstone flags and block paver products, so, again, its usefulness is restricted. What happens if a customer wants to know whether the limestone is a better choice than the granite? 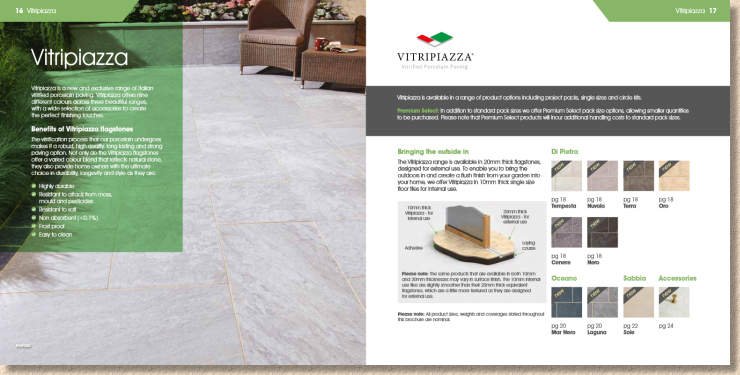 Let's get to the meal itself, and here's a strange starter right at the outset: porcelain paving revelling under the group name Vitripiazza. Hang on! Haven't they just spent page after page extolling the virtues of stone and the best part of half-a-page slagging off concrete? And then they start with so-called porcelain which is actually a high-performance ceramic surface on a backing of....errr....concrete! Oh well! Almost everyone else in the trade has clambered aboard the porcelain/ceramic/vitrified bandwagon, so it would be bad business for NP to stand on the sidelines, waving as they all hurtle past on the road to unrealistic expectations and enhanced profit margins. They've certainly gone for it big style. Nine different colour/texture options, in various sizes, and an impressive range of accessories including steps, edgings, pool copings and circle kits. Wow! They really have committed to this, haven't they? And such confidence before the market has even properly proved itself! That takes some serious cojones. There's been a lot of hype about porcelain, how it is the long-awaited Next Big Thing, but when the actual sales volumes are whispered in your ear by various sales directors, there's a sense that this could well be another bubble, where the manufacturers and suppliers talk themselves into a state of near apoplexy and start to believe their own guff, much as they did with permeable paving a decade ago. There's no doubt that porcelain/ceramics will sell, and will sell reasonably well, but they are not going to supplant the long-established and traditional market for natural stone which is still regarded as the obvious choice for most peoples' gardens and patios. Still, the porcelain palette put out by NP seems to be well-judged. Mostly greys of various depths, with a couple of warmer buff-ish tones. The Di Pietra range has a generous selection of sizes which will enhance its versatility, while the Oceano (darker greys and smooth finish) and Sabbia (travertine-a-like) are the bog-standard 600x600. They don't have images of the whole range: some are nothing more than swatches for now and I haven't seen any of them in real life (might go on a search for them over the Easter break), but given NP's record for selecting highly sale-able product lines, I have elevated expectations. Calm down....exhale....and let's look at what we expect to be the main course from NP: stone paving, and starting with the top-of-the-range Premiastone, which has four new flavours. Onyx is a dark grey quartzite flecked with truncated streaks of smoky quartz, while Noir Gold is a granite, moodily darker, sombre, funereal almost, that is said to have a gold sparkle which just isn't discernible in the brochure images. Storm is orangey-brown honed sandstone with dark brown banding on some pieces. Rydal, another honed sandstone, is much more cheerful, a lighter, brighter mix of grey-buff-brown tones that we expect from sandstones. All are available as Project Packs of three modular sizes, while the Noir Gold, Storm and Rydal can also be had as a 900x600mm single size pack of 32 (17.3m²). Both tap into the current taste for darker tones, and while I might entertain the Onyx and the Rydal, the Storm is well-named, and the Noir Gold makes it look as though it's going to absolutely chuck it down any minute now! Is that fair or is it just the photies they've chosen for the catalogue? Moving on down the menu, Cragstone is the more traditional-looking weathered finish stone, and has just the one new dish: Old York. I can see why they went with that name. 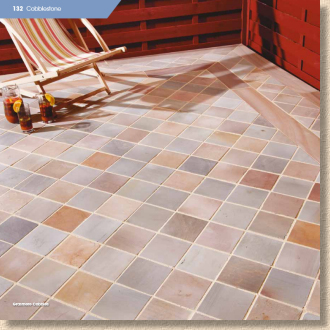 It has the grey-blues and rusty tans of weathered yorkstone, but, judging from the brochure photies, too much of the blue-greys and the rusty-orange is more rusty than tan. Again, it does look dark and chilly on the page, but is that how it looks in natural daylight? Available as a well-judged project pack, with a near ideal mix of sizes and quantities to create great-looking random layouts – so why show it in the brochure with so many god-awful crossed joints? Nothing new for Classicstone - it's a classic, so it shouldn't change too much, I suppose, or is it more a reflection of the waning appetite for plain old riven finish stone? Fossestone is the name given to the stone block pavers which have been around for a good few years now. 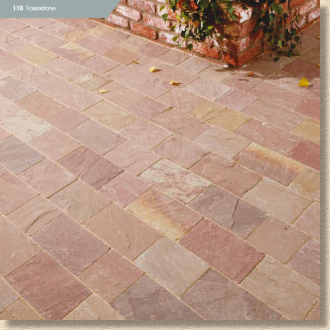 Just one newbie for 2016: Calluna, a thoroughly warming and cheerful pinky-browny-purpley sandstone, in the familiar three-size mix and all 50mm thick, so ideal for residential driveways, patios and paths. The blocks (setts?) have been through the weathering process which softens the arrisses and take the rough off the riven texture, and I can see this being a popular choice north of the English midlands, where warmer tones are more appreciated. Smooth Cobbles - errr, setts! The Vande Moortel Clay Pavers are still included. Thinking back to the will-we-won't-we uncertainty that tortured NP before committing to these pavers a few years back, it seems ridiculous that anyone would ever question their suitability or deny their organic harmony with natural stone. 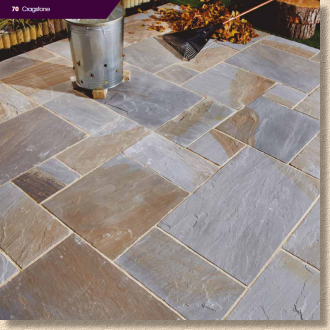 Walling: not really my thing, but from the three stone options, and a choice of riven (what we used to call split) or pitched face, there should be something to complement just about any of the stone paving shown elsewhere in the brochure. Adding Vande Moortel facing bricks to the range makes enormous sense, as long as the contractors can pronounce the very Dutch-sounding names! A quick word or two about the PaveTuf range. More than almost any other paving supplier, NP have put real effort into providing a fairly comprehensive range of quality ancillaries, from jointing mortars, to cutting blades, cleaners and sealants. Some of those PaveTuf sealants are under test here at Borlochs Hall right at this moment, and look pretty good, but you'll have to wait for the late Spring before the full results are published. The jointing mortars aren't quite right just yet, according to users providing feedback to this website, but they are still better than many, and represent good value. They will certainly appeal to the DIYers and I like the idea that a major supplier is putting their name to a range of products that will finish, clean and protect their own stone. Looking back on the 2014 review, harsh, but warranted, criticism was made regarding the quality of workmanship in several of the images used in the brochure. Warranted because Natural Paving run their own 'Approved Contractor' scheme, with an awards night, trophies and everything else normally associated with such schemes. If you boast about your network of quality contractors in your marketing, it seems only right that *only* quality installations should be shown in that marketing. I'm not party to the Natural Paving scheme; I don't know the contractors involved, I don't judge the entries or attend the awards ceremony, so all I have to go off are the images in the brochure. While there is, without any doubt whatsoever, a marked improvement in both the overall quality of workmanship shown in the brochure and the image quality itself, there are still a worrying number of elementary faults: the crossed joints mentioned in regard to Cragstone Old York, and so many instances of fiddly cuts, gaping joints and mixed jointing methods. 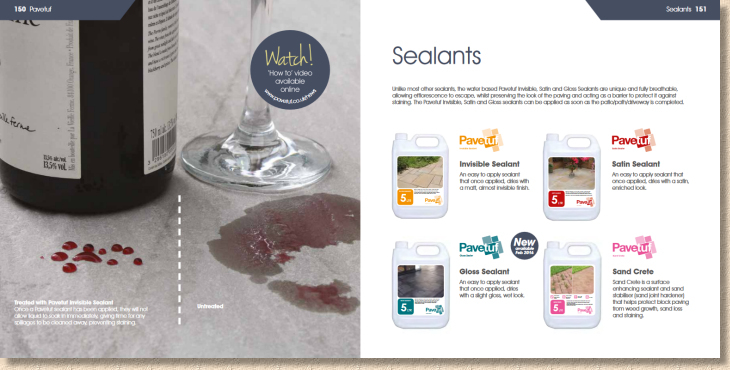 However, NP is not the only one guilty of this: there are far bigger suppliers proudly displaying much worse in their own brochures and marketing material, but it niggles me to see lovely paving let down by sub-standard installation. 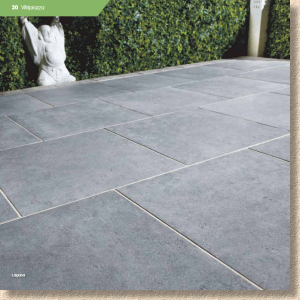 Of all the brochures I've looked at since the new year, and bearing in mind that I have no recollection of the 2015 edition, I have no hesitation in saying that the Natural Paving 2016 brochure is the most improved of any. The photography has moved up not just one level, but two at least, and the whole layout is so much better. There's a great balance between imagery, text and white space; the full-page photies are spot on; the packaging info is neat, logical and on-hand. The self-promotion is kept to a reasonable level, never becoming tedious, and some of the supporting information, such as the so-called Stone Standard, will make many other suppliers sit up and take notice. All in all, this is the best yet from one of the top suppliers to our trade. It's fair to say that Natural Paving definitely has to be considered if you have even the slightest interest in quality paving and hard-landscaping.